Blowout Sale! Free Shipping Included! 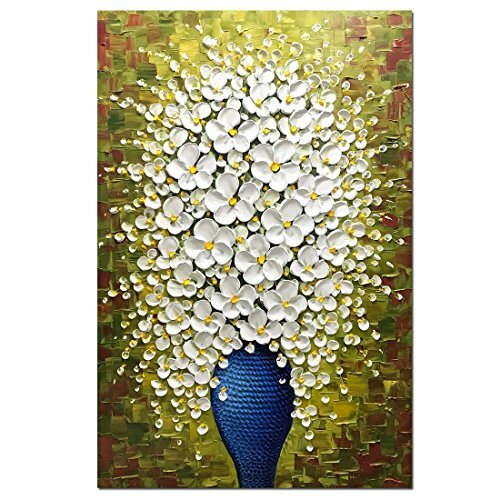 Save 63% on the Asdam Art-(100% Handmade 3D White Flower in Blue Vase Modern Art Abstract Oil Paintings On Canvas Vertical Wall Art For Bedroom Living Room Wall Decor(24x36inch) by Asdam Art at HoldUp Art. MPN: ASD068-6090. Hurry! Limited time offer. Offer valid only while supplies last. Size: 60*90cm(24*36inch)---To see closeups please click on above images. Materials: acrylic, impasto, texture, metallic, palette knife, large canvas, Mixed Media Acrylic. Materials: acrylic, impasto, texture, metallic, palette knife, large canvas, Mixed Media Acrylic. Stretched and Framed: Deep gallery back wrapped stretched canvas, painted edges, easy ready to hang. Buy with confidence! A perfect wall decorations oil paintings for living room, bedroom, kitchen, office, Hotel, dining room, bathroom, bar etc.A great gift for your relatives and friends. If you have any questions about this product by Asdam Art, contact us by completing and submitting the form below. If you are looking for a specif part number, please include it with your message.